Tom Clausen has long worked in the genre. Some early work can be found here, in a self-published chapbook dating to 1994. 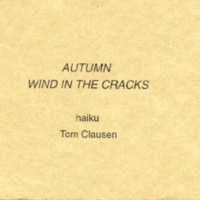 Clausen, Tom , “Autumn Wind in the Cracks,” The Haiku Foundation Digital Library, accessed April 20, 2019, http://www.thehaikufoundation.org/omeka/items/show/15.